After formal introductions, the evening began with a traditional nine-course meal, presented service à la russe by Minnesota Historic Recreation Society volunteers. I would have told you previously, polite Midwesterner that I am, that ignoring the servants who expertly placed our plates in front of us for each sequential course would have been the toughest part of the meal. It turns out eating a round of soup, fish, beef, sorbet, green, ice cream, fruit, and cheese in a laced corset was no mean feat. Thank goodness gloves were optional; I was having a hard enough time figuring out which was the proper fork. 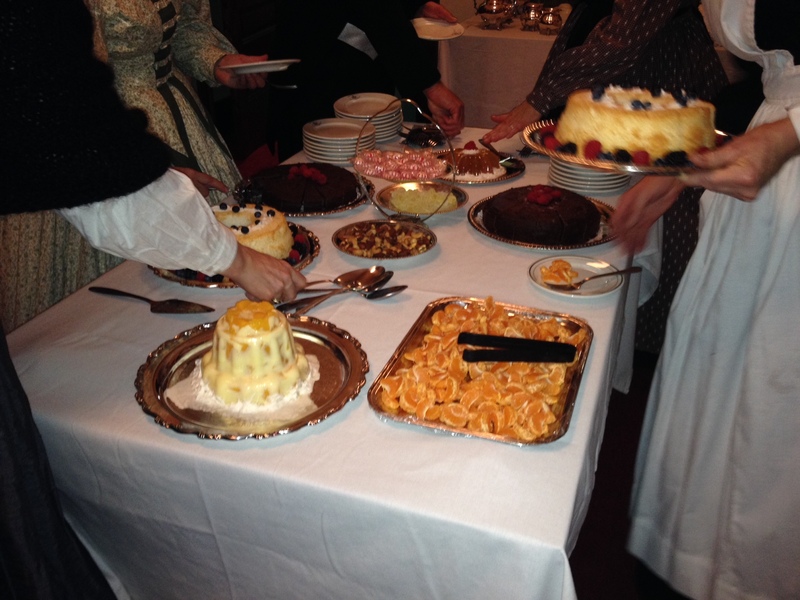 After dinner, punch and further dessert was served as the guests proceeded to the ballroom. Carefully presided over by a dancing mistress, a Grand March opened the first of three dancing sections, each nearly an hour long and running until late into the night. The dances included a Rustic Reel, several waltzes and polkas, and my personal favorite, a dance of continuously switching partners called a Sicilian Circle. Each dance included instructions beforehand, so even newcomers like me could join in. For those whose trains or hems were perhaps too long for the festivities, people watching from the sidelines was just as enjoyable. This was my first year attending this event, and on the whole, I couldn’t have been more pleased (my outfit was another story. Never truly done with our costumes, are we?) The food was authentic and tasty, the hundred-year-old Masonic Temple provided the perfect ambiance, and I couldn’t have asked for better company to take my mind off wondering how in the world women moved with all of this stuff on. 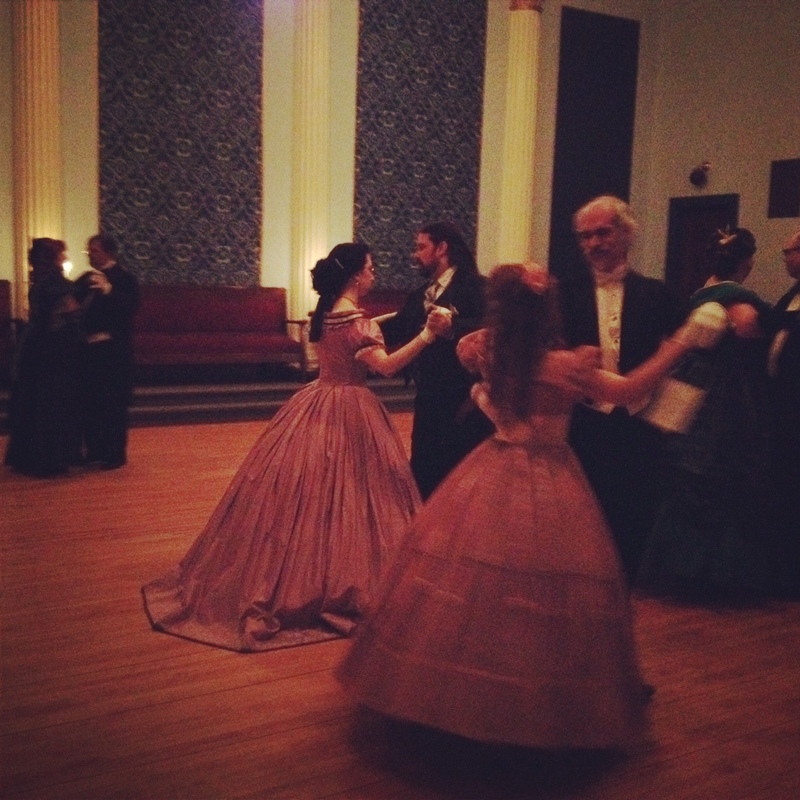 For those of you who missed the Winter Ball this year, you’ll get another chance to show off your finery in February at the Living History Society’s Inaugural Ball. For those of you without any Victorian garments just hanging around in your closets, not to worry-you have a whole month to sew! Final Verdict: Even Jo March couldn’t resist! Have a costuming event you think more people should hear about? Drop me a line at [email protected]! Marty is a lady who loves books, sewing, and cheese. She has a cat. She invites you to draw your own conclusions.